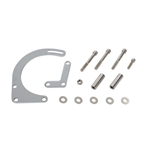 These low mount alternator brackets mount common Delco alternators below the frost plug at the left front corner (driver's side) of your small block Chevy using bolt holes next to the timing cover. They are ideal for custom builds, street rods, and tube chassis cars that do not have power steering and work with short ('55-'68 S/B Chevy) water pumps. 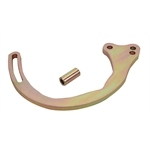 These brackets will support a standard full-size GM alternator which is sold separately. Includes bracket and spacers. Note: Watch for steering box clearance! 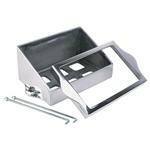 Complete kit with bolts and cast aluminum top hold down. Inside measurements are 6-3/4" x 10-1/4". This box will accept all of the Optima batteries with a very minor bit of grinding on the bottom mount flange of the battery. These low mount alternator brackets mount common Delco alternators below the frost plug at the left front corner (driver's side) of your small block Chevy using bolt holes next to the timing cover. 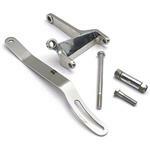 They are ideal for custom builds, street rods, and tube chassis cars that do not have power steering and work with short ('55-'68 S/B Chevy) water pumps. 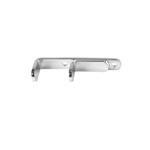 These brackets will support a standard full-size GM alternator which is sold separately. Includes bracket, bolts and spacers. Based on the Ford 1G "small case" alternators, these 60-amp King Chrome alternators are the perfect replacement alternators for most 1965-1981 Ford engines. 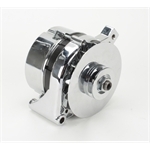 King Chrome alternator housings are hand polished to a high luster prior to applying the show-quality triple chrome finish. King Chrome alternators feature 100% all-new components (not rebuilt). These state-of-the-art electronic flashers work with standard bulbs. 12 volt operation (will not work on 6 volt systems). Made in the U.S.A. Note: We recommend the use of our grounded LED flashers for use with LED's (910-64110 2-prong). Note: We recommend the use of our grounded LED flashers for use with LED's (910-64112 3-prong). The Bad Boy is only 4-1/2" x 4-1/2" x 2-1/2" and its dual-tone air horn is two times louder than your stock horn. It can be used on cars, trucks, motorcycles, golf carts or even lawn mowers. 118 db of power at 530 hz and 680 hz. 12-volt built-in compressor and mounting hardware included. Mounts GM "Delco" style alternators beside oil pan at left front corner of your small block Chevy V8. Works with the short ('55-'68) water pump. Includes bracket and spacer. 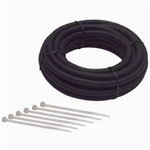 This plastic split wire loom allows you to clean up that ugly wiring under the hood for a more professional look. This tubing will group and protect your wires from damage. Simply lay out and insert wires, which will remain inside even with flex. Choose from 5 colors to customize your engine bay: black, dark blue, purple, red, or yellow. For early autos not equipped with right and left turn signals. 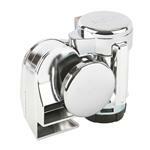 Chrome plated finish. Switch works with 6 or 12 volt systems. Includes wiring diagram. 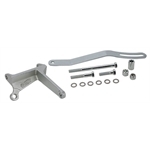 Clamps to any steering column with included stainless hose clamp. Switch has four-way flashers and does not self cancel. 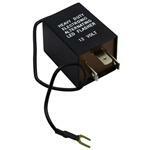 You will need to purchase a three-prong flasher to use with this switch (part number 910-64046 or install kit 91062861). For LED light applications, you will also need a LED dummy load resistor (part number 910-03030). Late 1950's and early 1960's S/B Chevys had the generator attached to the left exhaust manifold. 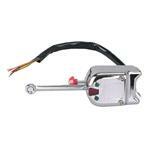 With headers installed, our brackets are needed to reattach your alternator. 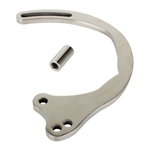 Slide bracket attaches at #1 cylinder exhaust port and works in conjunction with base bracket 720-9254. The technology of LED replacement blubs has come a long way the last few years. The problem is that they have gotten so efficient, that even electronic flashers that once worked, now don't. 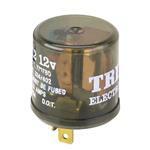 So now we offer a new grounded flasher made specifically for LED blubs.